The cached function creates a cached version of a pure function. This is the eighth post in a series examining the Vue.js source code line-by-line. In the last post, we began to examine the normalizeProps function. In this post, we take a quick detour to examine the background necessary to understand the camelize function. Before we can understand the camelize function, we must first examine the cached function. If hit exists (i.e., if the cached function has previously been called with this string as a parameter), then it returns hit. 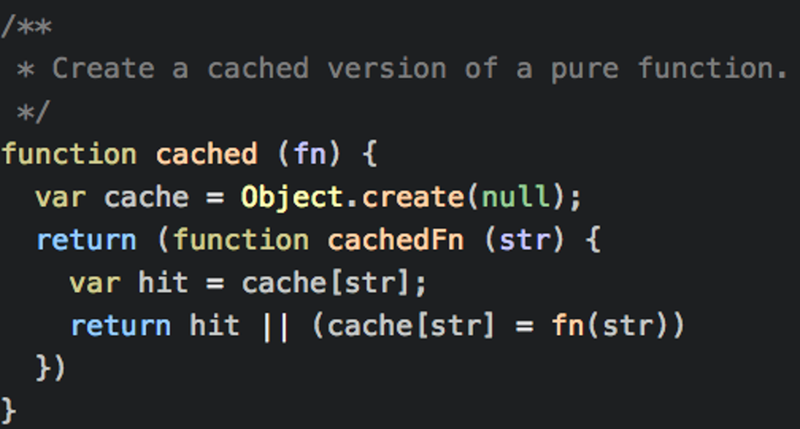 Otherwise, the function maps the str property on cache as the result of calling the fn function and passing str. This is an elegant way of caching prior function calls. The returned function has access to the fn parameter and the cache variable through a closure. Each time the returned function is called, a new property/key may be added to the cache object. If the property already exists, the function just returns the results rather than do the computations of the function again. If the property does not exist, it calls the function, sets the property, and returns it. With this background, we will be able to examine the camelize function in the next post.